Are you stuck suffering with allergies? Eyes are one of the most common places we get allergies, but if you aren’t sure what the symptoms are, you might be a bit lost when your eyes start to hurt. Not knowing might mean you accidentally try to treat the wrong eye issue. In fact, many people think that they are showing signs for pink eye when it’s just their allergies are flaring. On the other hand, you don’t want to brush off a serious eye issue as allergies and end up with long-term problems. That’s why we’re going to break down some of the top eye allergy symptoms here. Red eye is arguably the most obvious symptom of eye allergies. But here’s the thing: red eyes can mean plenty of other things as well. Red eyes can come from pink eye, dry eye, injuries, and even more serious diseases. At the same time, it can sometimes be just that you haven’t had enough sleep lately. So, don’t assume the worst if you have red eyes. In fact, it may be nothing at all, but if you’re showing signs of other symptoms, chances are you might have eye allergies. Although it’s common, eye swelling doesn’t always happen to people who have eye allergies. And, like red eyes, swollen eyes can be from a number of different things. More than likely though, swollen eyes come from allergies, and if you’re showing other symptoms, it’s likel that you have them. No, we don’t mean crying from the pain! Water discharge can range from clear and thin to thick and opaque. Thick and opaque water discharge usually means an eye infection is at play. Any kind of eye irritation can cause you to have water discharge, so make sure to consider other factors with this specific symptom. Unlike most other symptoms, itchy eyes are pretty unique to eye allergies. While pink eye has an itchy component to it as well, itchiness should help narrow it down to these two symptoms. Whatever you do, don’t scratch your eyes! This could cause damage if you’re not careful. Instead, consider wearing glasses outdoors to block pollen and other allergens. If you wear contacts, you might want to wear glasses during Spring to keep allergens from sticking in your eyes. Light sensitivity can be anything from a migraine to a lack of sleep to dry eyes. This can often be a cause of allergies, but don’t let it be the only thing you determine it as. Eye soreness is not something to ignore. For some, it could be a simple side effect from allergies, and for others, it might be a cause of a stye or glaucoma. Need Help With Your Eye Allergy Symptoms? 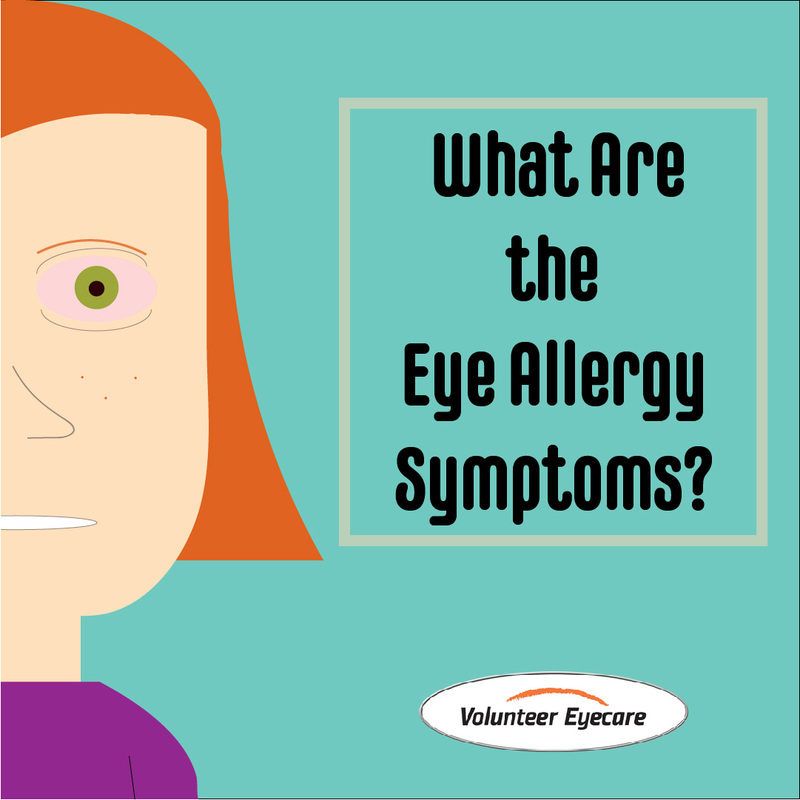 Eye allergy symptoms are nothing to joke about, and if you don’t know what they are, you might find yourself scratching away without an idea about what to do. Hopefully, this article will keep you from doing that. Keep in mind that having your optometrist look over any of your eye questions is best. They will be able to tell you exactly what’s going on. If you have any questions, please don’t hesitate to make an appointment with us. And for more about eye allergies, check out last week’s blog.